Honey Glazed Boneless Spiral Ham, 3-4 lbs. Oil Browned Boneless Turkey Breast 3 lbs. The perfect combination for smaller families or smaller appetites. 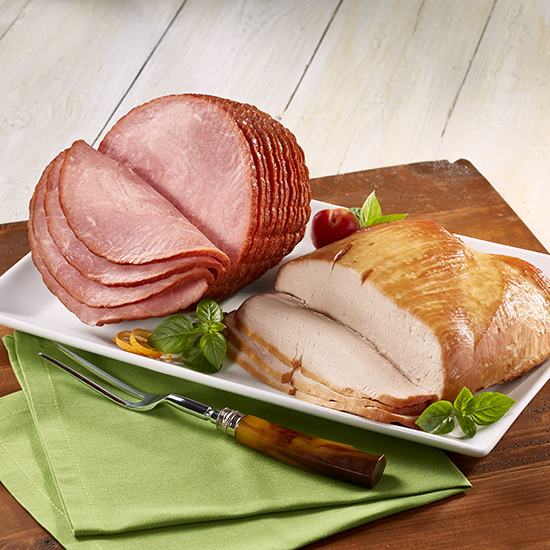 Our hickory smoked spiral ham and oven roasted-oil browned turkey breast are fully cooked, just heat and serve. Glazed with: Sugar, Honey, Water, Gelatin, Paprika, Dextrose, Spices, and Natural Flavorings. Cured with: Water, Brown Sugar, Contains 2% or less of Salt, Potassium Lactate, Sodium Phosphates, Sodium Diacetate, Sodium Erythorbate, and Sodium Nitrite. Ingredients: Turkey Breast, Turkey Broth, and 2% or less of Salt, Sugar, Vinegar, Sodium Phosphate, Carrageenan. Please note - we have changed our heating instructions to enhance the cooked product quality (more moist, less dry). Preheat oven to 275°F . Remove all packaging materials and place ham in a shallow roasting pan. Half hams should be cooked flat/face side down. Cover pan tightly with aluminum foil. Bake at 275°F for approximately 15 minutes per pound, until heated through. Do not overcook! Remove ham from oven and let stand 20 to 30 minutes before serving. Delicious recipes for tasty dishes and sides using your Smithfield Spiral Sliced Ham.